A Book to Make You Say, "Wow! Who Knew Arctic Misery Could Be This Much Fun?" A remarkable true story of adventure, betrayal, and survival set in one of the world’s most inhospitable places. In 1906, from atop a snow-swept hill in the ice fields northwest of Greenland, hundreds of miles from another human being, Commander Robert E. Peary spotted a line of mysterious peaks looming in the distance. He called this unexplored realm “Crocker Land.” Scientists and explorers agreed that the world-famous explorer had discovered a new continent rising from the frozen Arctic Ocean. Several years later, two of Peary’s disciples, George Borup and Donald MacMillan, assembled a team of amateur adventurers to investigate Crocker Land. Before them lay a chance at the kind of lasting fame enjoyed by Magellan, Columbus, and Captain Cook. While filling in the last blank space on the globe, they might find new species of plants or animals, or even men; in the era of Jules Verne and H. G. Wells, anything seemed possible. Renowned scientific institutions, and even former president Theodore Roosevelt, rushed to endorse the expedition. What followed was a sequence of events that none of the explorers could have imagined. Trapped in a true-life adventure story, the men endured howling blizzards, unearthly cold, food shortages, isolation, a fatal boating accident, a drunken sea captain, disease, dissension, and a horrific crime. But the team pushed on through every obstacle, driven forward by the mystery of Crocker Land and faint hopes that they someday would make it home. 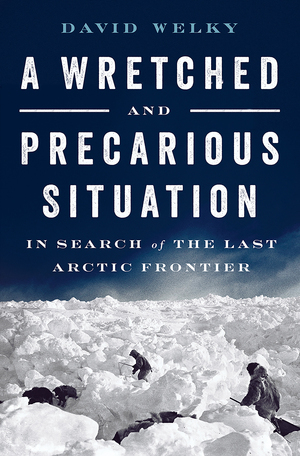 Populated with a cast of memorable characters, and based on years of research in previously untapped sources, A Wretched and Precarious Situation is a harrowing Arctic narrative unlike any other.